Ostomy Pouch Bag Tail Closure is a straight clip closure ConvaTec ostomy clamp that's ideal for use with drainable pouches. This clamp provides unparalleled security by offering a clicking noise when closing the tail closure, making it easy for patients to rest assured that the tail is completely closed. Specifically designed for use with a drainable ostomy pouch without a clipless tail closure, this tail closure clamp is soft, comfortable and flexible. Ostomy Pouch Bag Tail Closure is designed to provide the optimal amount of security, ensuring a leak-free experience throughout the entire day. 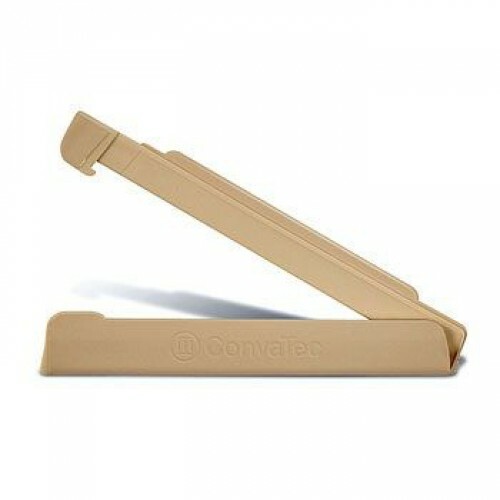 This ConvaTec ostomy clamp provides comfort, flexibility and security with a fail-proof fit, making it the ideal clamp to use with a drainable ostomy pouch. You may also be interested in other ConvaTec ostomy supplies and similar ostomy products, such as Ostomy Bag Drainable Pouch Clamp. Straight clip closure design is ideal for use with drainable pouches and prevents against leaks throughout the day. Provides improved security by creating a clicking noise when the tail is closed, alerting and ensuring wearers that the tail is closed completely. Soft, comfortable feel provides greater flexibility, improved security and substantial leak reduction.